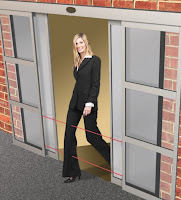 Meeting international standards for pedestrian door applications with 12m range, 5-degree optical angle and excellent EMC performance. Carlo Gavazzi Automation has expanded its family of pedestrian door and entrance sensors with the introduction of a new slimline device. The PD70 sensor measures just 11.5 x 11.5 x 70mm, making it suitable for installation in narrow aluminium door profiles as well as pass gates, turnstiles and other applications where space is limited. Designed in accordance with the latest standards for Europe and North America, the PD70 complies with regulations such as EN12978, EN12445, EN12453 and UL325. Its high efficiency aspheric lens geometry increases sensing distance to 12m, and provides s a wide +/- 5 degree detection angle that nevertheless meets ESPE-2 industry norms. Sensitive components in the receiver are covered by a metal shield, which not only ensures high EMC immunity, but also functions as the aperture for the received beam. Sensor and emitter are powered by a 10-30V DC supply. The 100mA receiver output is available with NPN or PNP transistors, and with either make (NO) or break (NC) switching. A separate test input (mute) on emitter allows fast verification of the sensing functions, typically required to be carried out daily. Solid polycarbonate construction, together with IP67 protection against dust and water ingress, extends the applications from entrance safety and control, out to industrial doors and retail checkout counters. Mounting holes are provided for self-cutting 2.9x10mm or M3 through-hole screws, so the PD70 can be installed as a replacement for existing popular door sensors, whether in retrofits or new builds. A double sided tape is supplied to simplify the installation of the sensor fixing screw.